whom, for reasons known only to himself, thought to gift this Nashorn to me. He did say, however, that he remembered the birth, life and untimely death of my previous Nashorn, and 'felt sorry for me'. I'm paraphrasing there, and putting words into his mouth, but hey, that's the gist of it. Humbled by his generoustiy and thoughtfulness, I have delved into my stash and am donating a boxed Tamiya 1/35th Cromwell to his Models for Heroes work. 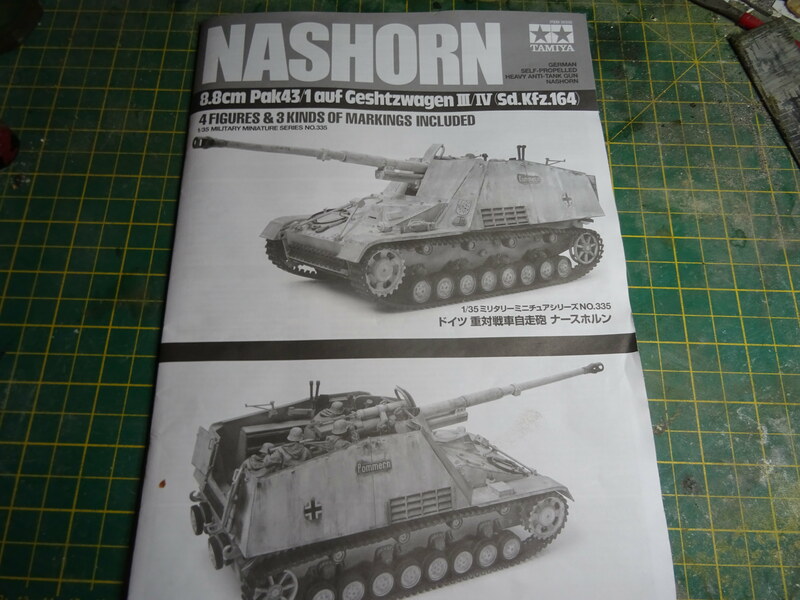 I originally entered this GB, intending to have a second go at a Nashorn, with full PE, but I discovered that the price of said model had risen by 30 percent in the past 2 years, from over 30 quid, to over 40 quid, and the full PE has increased in cost as well, taking the total to over 100 quid! That was too rich for me. 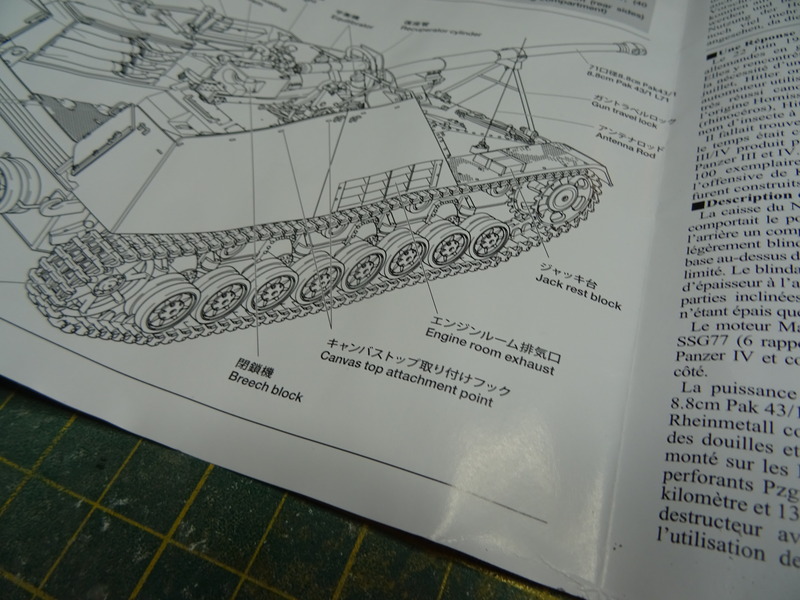 I decided then, to fall back on Tamiya's Golden Oldie, StuGIV and uprgade this with PE and PE zimmerit - a lot of PE, but still a fraction of the cost of the full-beans Nashorn. Ozzy's kind gift though, has ressurrected the Nashorn, and, after much deliberation and studying of the interweb, I have realised that the full beans PE isn't worth the money anyway. There are no PE parts for the gun itself, and really, the only 'worthwhile' parts are for the ammo boxes. And the racks inside those boxes are (in my experience) a bit of a pig to make. The kit's gun barrel is pretty good, requiring only minimal 'de-lousing' and is nice and straight, so I won't bother with a metal replacement. The tracks are pretty good too, so I won't be bothering with an upgrade there either. This Nashorn then, will be OOB. In honour of my previous NASHORN, RIP (Rest In Pieces) I shall be sticking with the winter camo. This time, however, I will NOT be using hairspray 'juice' and bicarb for snow effects. 'Tis this, I believe, combined with a final rinse in warm water, that caused the orginal to begin to fall apart in my hands, and prompted the 'absolute' falling apart due to sudden, repeated, and violent impacts against the hot water tap. Finally, 'Pachyderm' is a term most often associated with elephants, but it does encompass any thick-skinned, hoofed mammal, including elephants, hippopotamusessesses, and rhinoceri. 'Nashorn' (for those who don't know) is German for 'Giraffe'. No. Really. It's not. Good luck to all in the GB, and even if you don't get to finish on time (I may well be one such person) PLEASE DO STILL VOTE! Great to see you in with the Nashorn Badder!! Really looking forward to following your progress. Your Sherman GB build resulted in some of the most realistic finishing and weathering I have seen. Nashorn and Hummel are nasty looking machines! Glad my expert packing got through the Christmas post. All thanks to Ozzy, Stix - I can't thank him enough! And you are too kind about my Sherman's winter camo. I confess it was a piece of cake. I seriously believe that dirt/dust/fine grit in the paint helped with the effect, and it wasn't intentional! 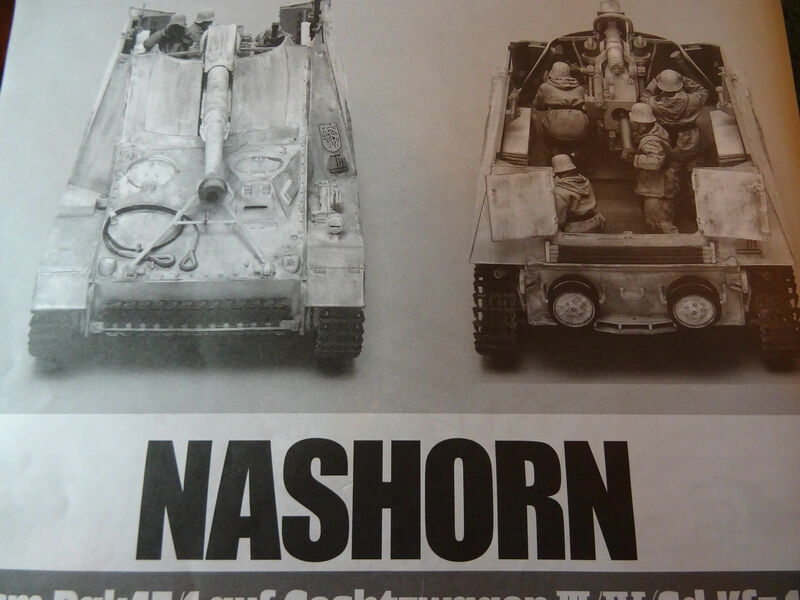 The Nashorn is a different kettle of fish though, what with those expansive and plain side panels. Chipping whitewash is more effective on detailed parts, I reckon. I'm probably going to go for a 'cleaner' look. Probably. Maybe. You're not wrong there guys! I think the early Hummel with the exhaust muffler wins it by a whisker, just for that extra little detail. But I'm looking at some WWII Nashorn photos and I'm liking the look of a few of them. i may be scratching a few bits and pieces after all. Here is a photos of my first Nashorn, and my first(? )a ttempt at a heavily worn, winter camo. Shortly after this photo was taken, I decided to add bicarb snow, which was stuck in place with painted-on hairspray lacquer. I later changed my mind and it was whilst trying to remove this bicarb/lacquer, by soaking, that the Nashorn began to fall apart. Bear in mind that I'd previously 'completed' the painting, as seen in the photos below, but had to strip the whole lot back to the plastic after the ruination of the finish. To strip the entire model back to the plastic took over 2 weeks, so I was very pleased with how the repainting turned out in the photo above. You can imagine my horror when if began to fall apart. Ultimately, the thing deserved being smashed to pieces! This time, I am fully confident in my winter camo techniques, and WON'T be adding bicarb snow to the vehicle! It was a shame what occurred with that Nashorn! Hopefully this new one will work out properly! The first job, currently underway, is the soaking of the sprues in warm 'detergentiferous' water. Still unable to type/edit or add anything to an un-posted post once I've done a '@member's name' tag. tut. Tried saving/submitting and editing, but still no joy. I will post pics of each sprue as and when I come to use them. I find sprue shots fairly boring TBH! Just deciding where to start..... the gun, or the chassis tub? I find sprue﻿﻿﻿﻿﻿ shot﻿s fairly boring T﻿BH﻿! Each to his own I suppose. 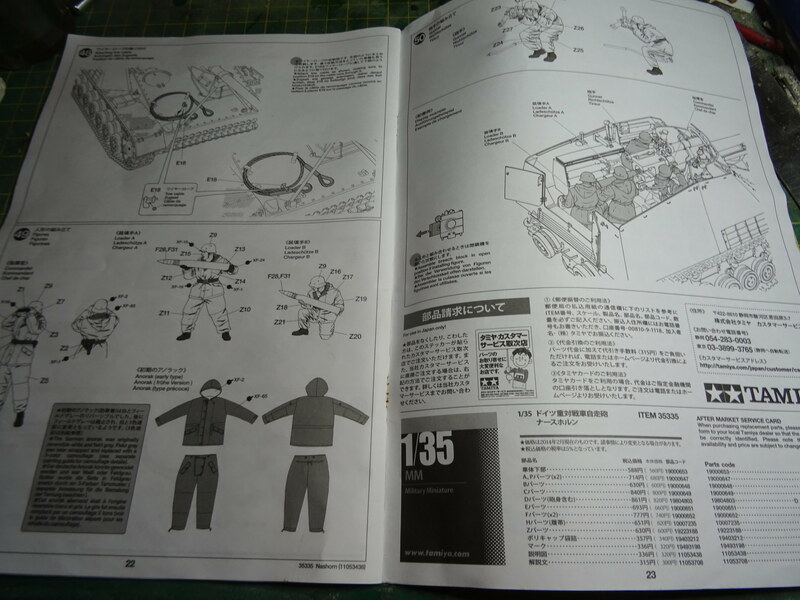 I actually like to see the sprue photos - especially if it's a kit I might be interested in getting at some point. 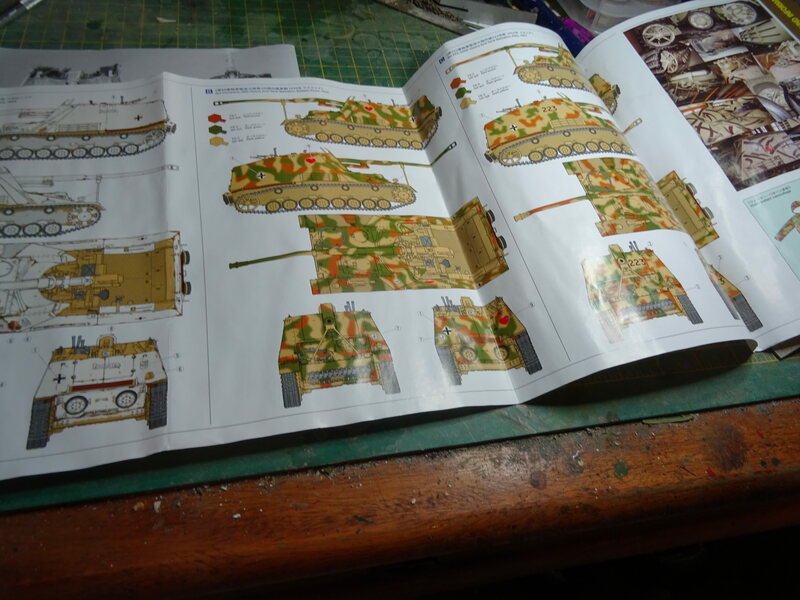 It helps me understand what modellers are facing when making their kits. With a kit like the Dragon/Platz kit I'm making - because it has the name Dragon involved - most people would assume that the number of sprues involved fill the box to capacity - so that once you've taken them out the first time it's almost impossible to close the lid again! My kit only has 5 sprues despite it being from Dragon. Whenever I look at a review of a kit I always want to have a look at the sprues in detail. I, for one, am looking forward to seeing the sprues for your kit! Okay, I concede that I AM INTERESTED in seeing sprue shots for those kits I may myself be purchasing at some point. And I suppose that 'surprising' sprues, such as those which have fewer parts than might be expected, or indeed the opposite, can be interesting as well. But otherwise I do find the majority a bit boring. 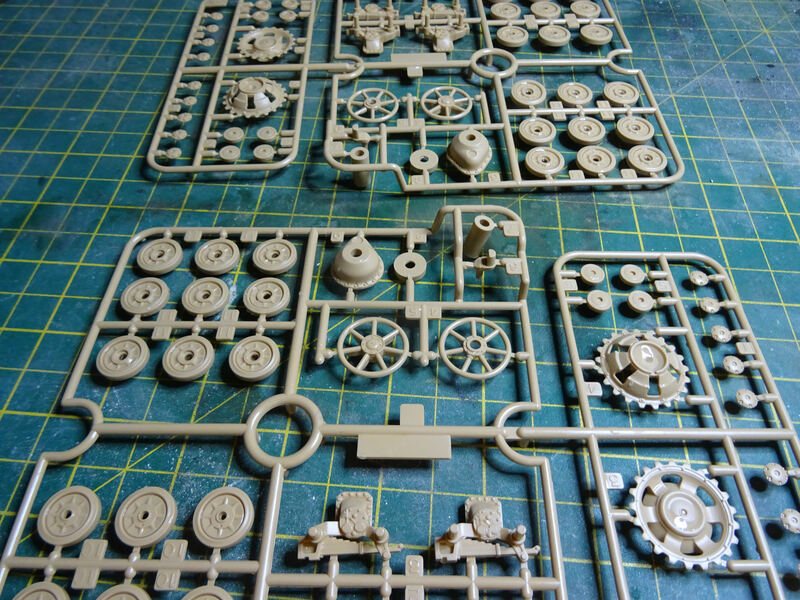 But I will, as I say, post sprue shots as and when I use them, like very shortly! 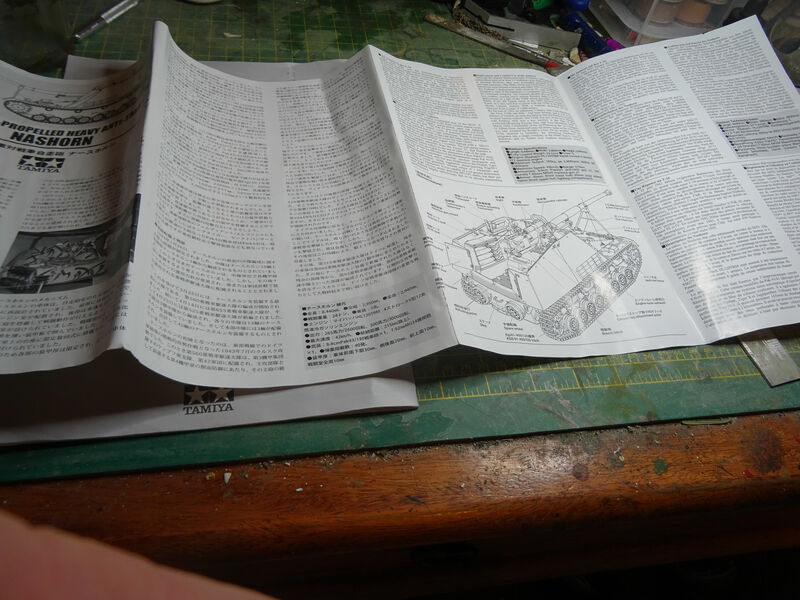 So, here's the instruction manual for the Nashorn. All 24 pages of it. Also visible here is half of my cutting board, which had until this morning been obscured for the past 6+ months by a scratch-built building in progress. I didn't photograph the the other half of my cutting board as I haven't been able to find it. I'm guessing it's somewere under that steel ruler and file somewhere. Tie down points for a canvas cover for the fighting compartment. I've seen lots of photos of these covers in place or rolled up, but there's no representation of these in the kit. I shall be adding one! 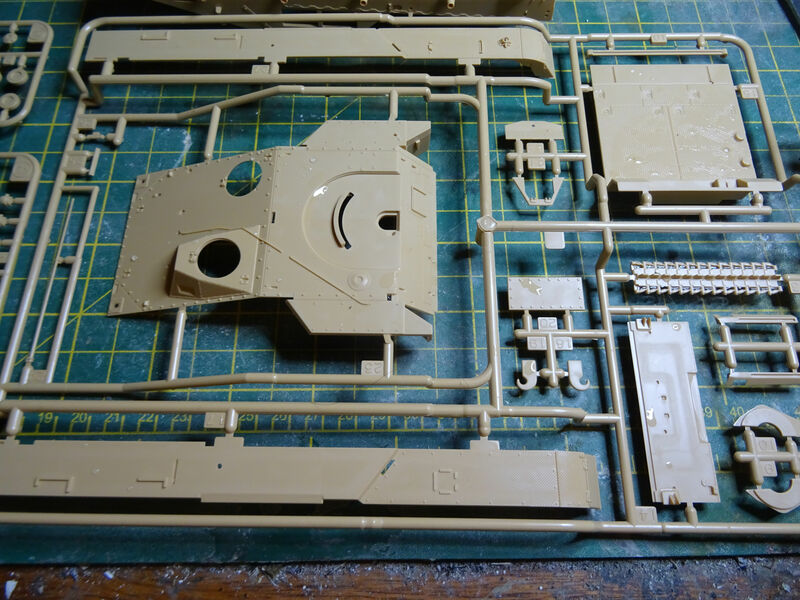 So to the build, and first, the sprues which include parts for the chassis tub and running gear. The only work required here is to remove the 'sprue' in the central access hatch and glue the hatch cover in. All of the parts are quite clean as well, requiring minimal seam removal and nothing in the way of filling. 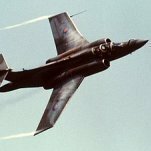 From experience, I know that there will be issues with ejector pin marks on the interior of the rear doors, and all of the panels in the fighting compartment, and the gun shield. Great stuff Badder! Thank you! Okay, another update, but only because the two track pin retainer plates are on the two 'F' sprues. Mostly, the F sprues contain parts for the ammo cabinets. 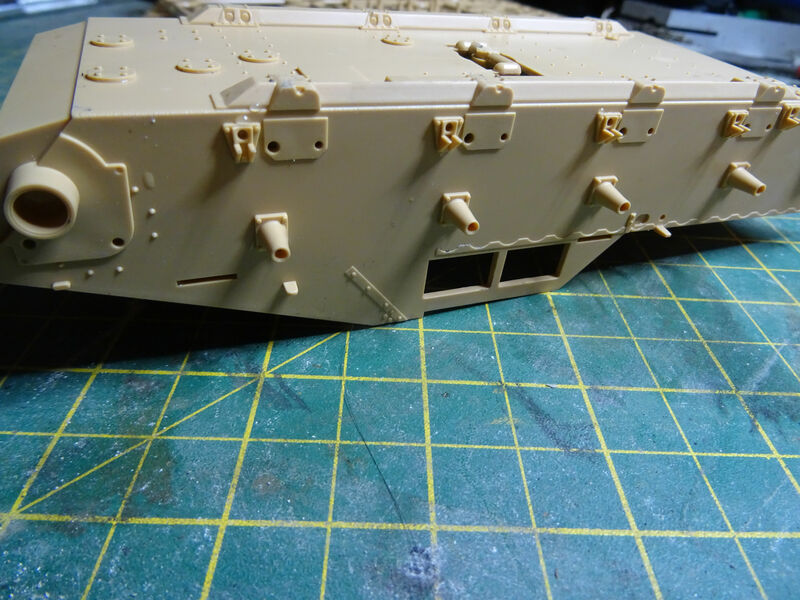 For the previous Nashorn I purchased the Eduard PE ammo box and floor panel set. For around 18 quid IIRC. The floor plate - yes, it was just one floor plate - was a complete waste of time and money and utterly unnoticable when fixed in place, and the ammo boxes were a right pain to make - especially the internal racks - the instructions for folding those being pictorally indecipherable. Having said that, I've seen others use them and construct them correctly and they do look a bit better in PE. Personally, I don't think they are worth the money, or the extra, frustrating, time. No photo update of the chassis tub, but I have fixed the hatch cover to the underside, the rear plate to the chassis tub, the bottoms of the suspension brackets and the eyed plates which fit to the front end of the tub and half-way around the drive sprockets. I'm not sure if these plates existed in real life, or they are just there as 'something for the modeller to do'. I will continue with fitting parts to the tub, and maybe start on the wheels tonight. Glue.... Tamiya's Extra Thin Cement. A sharp scalpel for part removal. A blunt scalpel for seam removal. A ladies nail emery board for any protruding ejector pin marks - none yet. Seam removal was required on the leaf springs/suspension arms, the exhaust pipes and the hooks at the rear. None of the seams were prominent, and in truth only those on the hooks would be visible, but they all had to be done. The next session will begin with the addition of the final suspension units. After that I will move on to the wheels. None of them will be fitted though, as I will be looking for after-market tracks. Friul make tracks for both, 40cm mid production tracks for Nashorn & 38cm early tracks for the Fahrgestell. Hi Badder. Looks like you made good progress yesterday. Looking very good it is too! Pretty basic stuff so far Stix. I'd be worried if it was looking a bit ropey! It's a funny thing - and I don't know if I'm 'unique' in this - but I've never liked the look of tracked vehicles when viewing them side-on. It's all down to that 'boring' regularity of the identical wheels, suspension units and track links, I believe. I think that detracts from the rest of the vehicle. To me, AFVs look more threatening, powerful and interesting, when viewed from the front, or from 3/4's. Last of the suspension units on. Now to construct the wheels. I used to remove all of the wheel parts from the sprue, clean them up, paint them, then glue the inners and outers together before weathering them. This doubles the rate of progress. And now that I have a jolly good airbrush, I feel confident in being able to paint the wheels AFTER they've been constructed. This means I don't have to 'touch them up' after gate mark and seam line removal. In this case though, I won't be painting the wheels for a while yet.